A TURN TOWARD THE WEST IS EXPECTED LATE SUNDAY. 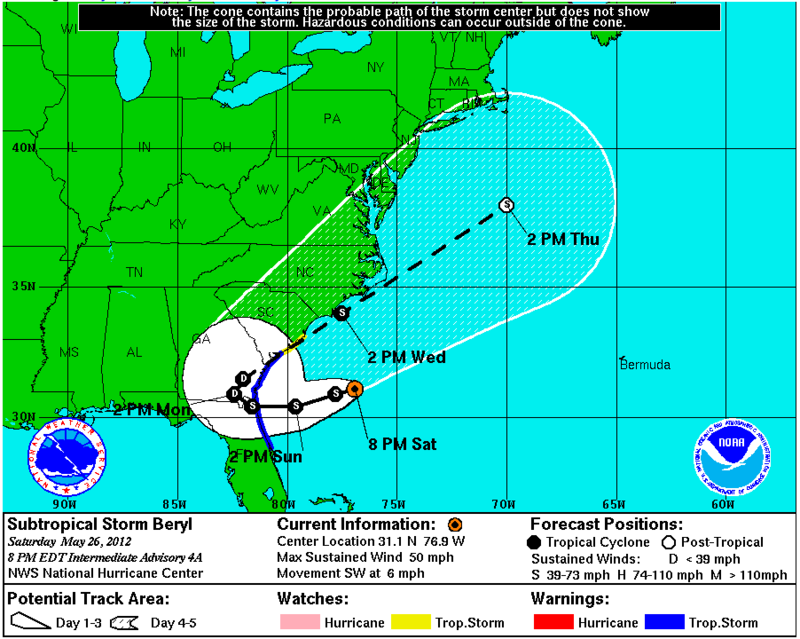 ON THE FORECAST TRACK…THE CENTER OF BERYL WILL BE NEAR THE COAST WITHIN THE WARNING AREA BY LATE SUNDAY. REPORTS FROM AN AIR FORCE RESERVE HURRICANE HUNTER AIRCRAFT INDICATE THAT MAXIMUM SUSTAINED WINDS ARE NOW NEAR 50 MPH…80 KM/H…WITH HIGHER GUSTS. LITTLE CHANGE IN STRENGTH IS EXPECTED DURING THE NEXT DAY OR TWO WHILE THE CENTER REMAINS OVER WATER. TROPICAL-STORM-FORCE WINDS EXTEND OUTWARD UP TO 90 MILES…145 KM FROM THE CENTER. While Beryl is not expected to come even close to hurricane strength, it could cause dangerous wind, surf, tides, and rain. There were apparently 20 rescues at Tybee today because of rip currents. The currents will be more unpredictable overnight and on Sunday (it’s possible much of the day could seem like beach weather). Also, note that while the computer models are in very close agreement about Beryl’s track before landfall, there’s considerable disagreement about when and how much it will make that predicted U-turn. Click here for more on that at Weather Underground. At one extreme, the NOGAPS model has Beryl basically retracing its path pretty closely, while the GFDL has the weakened storm remaining inland as it travels north until going back out to sea over Virginia.